Pension debt in the Land of Lincoln is a big problem. So big, in fact, that it would take three years of a complete government shutdown, during which the entire general fund went toward pensions, just to break even. No funding for schools, no money for public safety and nothing for health care and human services. 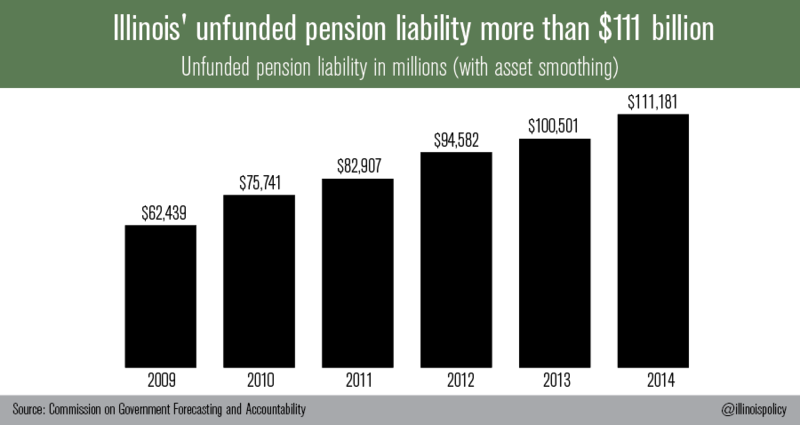 Illinois’ unfunded pension liability grew to more than $111 billion this year, according to official estimates. That’s a $48 billion increase just since 2009. That $111 billion pension shortfall means the state now has only 39 cents of every dollar it should have in the bank today to pay for future benefits. In the private sector, these funds would be deemed bankrupt. Gov. Pat Quinn signed into law Senate Bill 1 last December, which is projected to reduce the state’s annual pension payment by more than $1 billion. But SB 1 is still bad news for Illinois. The bill may provide temporary relief, but it does nothing to fix the current defined-benefit system. And it keeps Illinois politicians in control of public-employee pension funds. Illinois’ history with politician-run pensions shows that’s a recipe for disaster. SB 1 is currently tangled up in the courts. But as we wait for a decision, Illinois’ pension debt continues to grow. The state’s pension payment for the current budget year totals $6.9 billion, and without reform, that pension payment will balloon to $7.6 billion for the 2016 budget year; an increase of $681 million. Illinois politicians have looted and mismanaged public-employee pension funds for decades. The system is no longer sustainable or affordable. With or without SB 1, the same politicians who got the state into this mess will continue to control and abuse the retirement security of public employees. It’s time to take politicians out of the retirement businesses.